Achieve perfectly ironed clothes with this fantastic Beldray ironing board. It features non slip plastic feet, a hanging rack to hang your ironed clothes from and a rack underneath for extra storage, as well as a soft cover made from 100% cotton with a gorgeous turquoise home sweet home print. The iron rest is large enough to accommodate a steam generator unit so you can use steam to smooth your clothes if you prefer and the board then simply folds away after use for wonderfully easy storage. 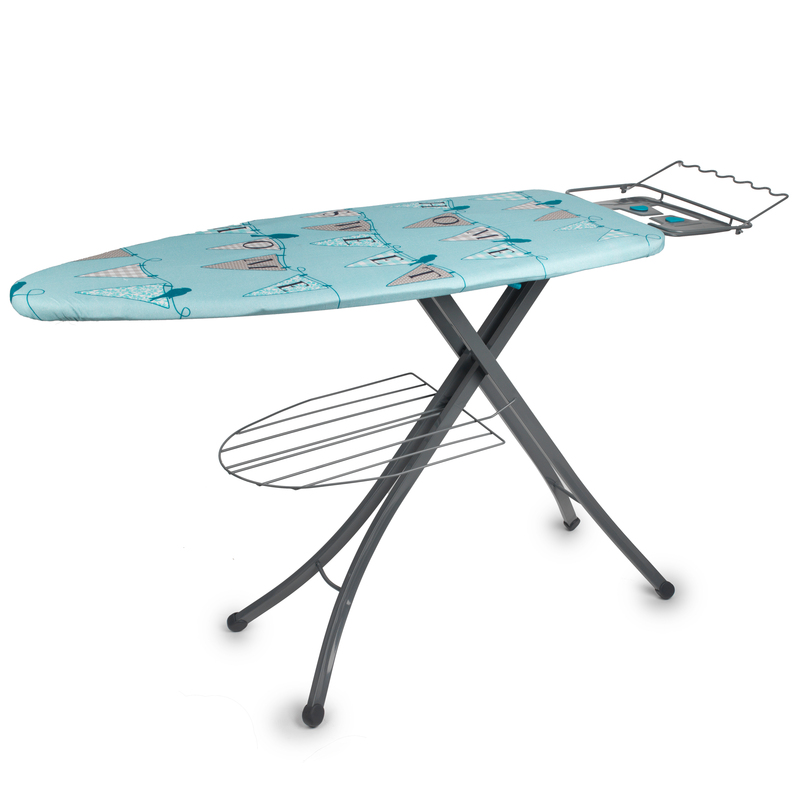 Iron with ease on this Beldray ironing board featuring a clothes rack and hanger so you can benefit from more clothes storage space. The board measures 126 x 45cm with an added 40 cm for the iron rest. It sits at a comfortable height of 90 cm and folds up for storage. A clothes rack sits securely under the ironing board which is ideal for extra storage if you are ironing in a room with limited space. Hang your freshly ironed shirts and blouses using the built in hanger so they can be stored without creasing until you are finished. The iron rest features silicone grips to hold the iron safely and is large enough for you to place a steam generator on while you iron.